The above photo is from last year, October 4th to be exact. I’m not ready for snow quite yet! 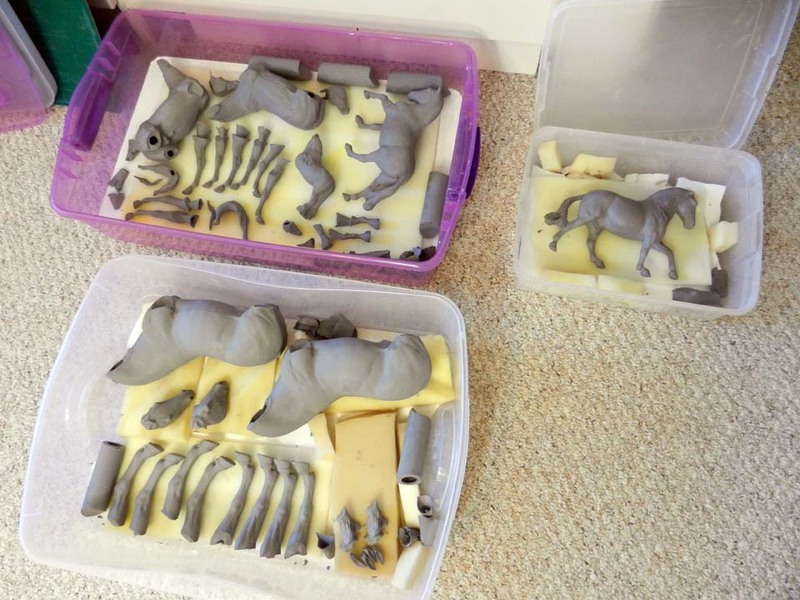 These pieces (2 Boreas Percherons, 2 Optime Arabians, 2 Roundabout cobs, and a Juniper, so far) are intended for a special project later this month. Stay tuned for news about that, especially via the Facebook page. I’ve run out of wet-box space so I can’t cast any more until I finish customizing the Roundabout and put one of those big Boreas together! The only thing I accomplished in the Art Dept. this summer were these Bighorn Ram pins. These were sculpted by me and cast in porcelain, and then I glazed them into 5 different colors. There are 50 total. They are thank-you gifts for a local hiking group Paul and I are involved with here. I have a few left over, and I’m offering one of each color for sale. (There was also a cobalt blue color but there were only a few of those and they’re gone.) They measure 1 1/8″ and have a pin-tack back. These are available now, first-come, first-served, only one per person. Please specify the color that you want, and give 2nd choices. To buy, send an email to: Email Karen. Or if you are reading this on Facebook, you can contact me via Message. Have a lovely fall season! NextWinter = Commission season for custom glazing!